In my family, I’m the chief “cooker” and my daughter is the chief baker. I bake cakes or cupcakes only for birthdays and Father’s Day and, occasionally, a fruit pie or pumpkin cheesecake for Thanksgiving. That’s it! So my daughter realized at a young age that if she wanted to satisfy her sweet tooth she was going to have to take things into her own hands! And that she did – she’s 18 years old and has been baking since middle school. Cream the butter and brown sugar together in a large bowl. Mix in eggs, canola oil, applesauce, and vanilla. Add the dry ingredients and blend well. Fold in chocolate chips and nuts. Spray cookie sheet with canola oil. Use a spoon to drop batter onto cookie sheet, making rows of three with 2 inches in between. Bake for 15 minutes. Makes about 60 small cookies. 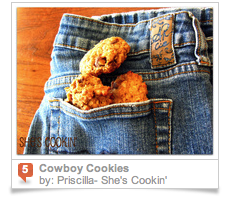 This post made the FoodbuzzTop 9 on June 5, 2010. This has to be the cutest picture I’ve seen all day. I have been craving a fresh batch of cookies, and this recipe only makes me want them more. Thank you for sharing! .-= Monet´s last blog ..Cherry Almond Wheat Rolls =-. now thats a great cookie!! Love the photo!!! .-= Chef Dennis´s last blog ..It’s That Barbecue Time of Year! =-. .-= Magic of Spice´s last blog ..What’s for Dessert – Caramelized Asian Pears with Cayenne Tinged Whipped Cream =-. That is really funny, I love that you put the cookies in the pocket! Sounds super delicious.